“One thing have I asked of the Lord, this I seek: To dwell in the house of the Lord all the days of my life . . .” Psalm 27:4. Prayer before the Blessed Sacrament is nothing less than a close, private conversation with a living person who is Jesus Christ in the Eucharist. It is about as close as we can come in this life to talking with God face to face. You are very important to the Lord. To spend your special hour with Him, e-mail holyhour24@gmail.com. Chapel hours are 6:00 a.m. – Midnight. 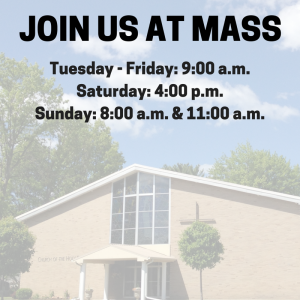 Tuesdays: 11:00 a.m., 1:00 p.m.
Fridays: 1:00 p.m., 2:00 p.m., 11:00 p.m.
Saturdays: 9:00 a.m., 10:00 a.m., 12:00 p.m., 2:00 p.m., 4:00 p.m., 6:00 p.m., 11:00 p.m.
Sundays: 10:00 a.m., 11:00 a.m., 6:00 p.m.